Hi there! 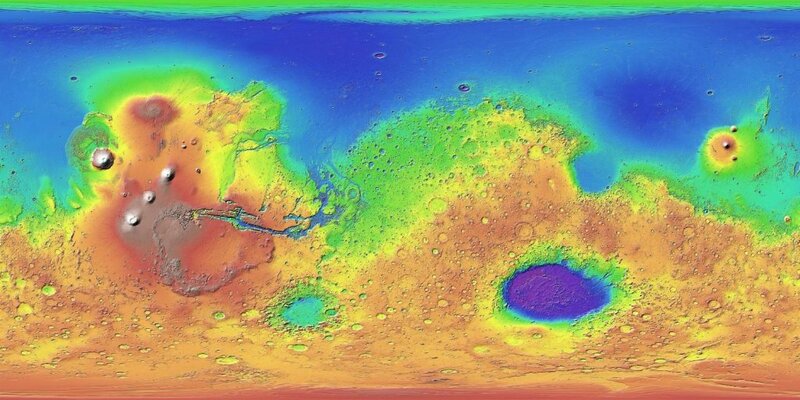 Today I will give you the composition of the subsurface of the lowlands of Mars. This is the opportunity for me to present you The stratigraphy and history of Mars’ northern lowlands through mineralogy of impact craters: A comprehensive survey, by Lu Pan, Bethany L. Ehlmann, John Carter & Carolyn M. Ernst, which has recently been accepted for publication in Journal of Geophysical Research: Planets. As you can see on this image, the topography of Mars can be divided into the Northern and the Southern hemispheres, the Northern one (actually about one third of the surface) being essentially constituted of plains, while the Southern one is made of mountains. The difference of elevation between these two hemispheres is between 1 to 3 km. Another difference is the fact that the Southern hemisphere is heavily cratered, even if craters exist in the lowlands. This Martian dichotomy is very difficult to explain, some explanations have been proposed, e.g., the lowlands could result from a single, giant impact, or the difference could be due to internal (tectonic) processes, which would have acted differentially, renewing the Northern hemisphere only… Anyway, whatever the cause, there is a dichotomy in the Martian topography. This study examines the lowlands. Plains also exist in the Southern hemisphere, like the Hellas and the Argyre Planitiae, which are probably impact basins. But this region is mostly known for Olympus Mons, which is the highest known mountain is the Solar System (altitude: 22 km), and the Tharsis Montes, which are 3 volcanoes in the Tharsis region. To know the subsurface of a region, and its chemical composition, the easiest way is to dig… at least on Earth. On Mars, you are not supposed to affect the nature… Fortunately, the nature did the job for us, in bombarding the surface. This bombardment was particularly intense during the Noachian era, which correspond to the Late Heavy Bombardment, between 4.1 to 3.7 Gyr ago. The impacts excavated some material, that you just have to analyze with a spectrometer, provided the crater is preserved enough. This should then give you clues on the past of the region. Some say the lowlands might have supported a global ocean once. Liquid water seems to have existed at the surface of Mars, until some 3.5 Gyr ago. There are evidences of gullies and channels in the lowlands. This would have required the atmosphere of Mars to be much hotter, and probably thicker, than it is now. The hypothesis that the lowlands were entirely covered by an ocean has been proposed in 1987, and been supported by several data and studies since then, even if it is still controversial. Some features seem to be former shorelines, and evidences of two past tsunamis have been published in 2016. These evidences are channels created by former rivers, which flowed from down to the top. These tsunamis would have been the consequences of impacts, one of them being responsible for the crater Lomonosov. The fate of this ocean is not clear. Part of it would have been evaporated in the atmosphere, and then lost in the space, part of it would have hydrated the subsurface, before freezing… This is how the study of this subsurface may participate in the debate. To study the chemical composition of the material excavated by the impacts, the authors used CRISM data. CRISM, for Compact Reconnaissance Imaging Spectrometer for Mars, is an instrument of Mars Reconnaissance Orbiter (MRO). MRO is a NASA spacecraft, which orbits Mars since 2006. In this study, the authors used CRISM data of 1,045 craters larger than 1 km, in the lowlands. They particularly focused on wavelengths between 1 and 2.6μm, which is convenient to identify hydrated minerals. And after this treatment, the authors identified two kinds of minerals: mafic and hydrated ones. Mafic minerals are silicate minerals, in particular olivine and pyroxenes, which are rich in magnesium and iron, while hydrated minerals contain water. They in particular found a correlation between the size of the crater and the ratio mafic / hydrated, in the sense that mafic detections are less dependent on crater size. Which means that mafic minerals seem to be ubiquitous, while the larger the crater, the likelier the detection of hydrated minerals. Since larger craters result from more violent impacts, this suggests that hydrated minerals have a deeper origin. Moreover, no hydrated material has been found in the Arcadia Planitia, despite the analysis of 85 craters. They also noticed that less degraded craters have a higher probability of mineral detection, whatever the mineral. However, the authors did not find evidence of concentrated salt deposits, which would have supported the past ocean hypothesis. The study, for which the authors paid extra fees for Open Access, many thanks to them! And the one of Carolyn M. Ernst.